Catalog number PZB-CS. This classroom set contains 10 Puzzle Board Kits. 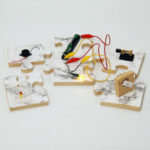 This unique learning kit is used for several activities in the Unit 1. Introduction to Electricity of the Exploring Physics Curriculum App. 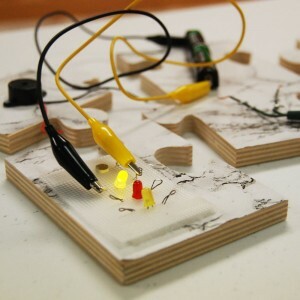 While introducing the concepts of contact points, closed circuits and the direction of flow of current, it also functions as a classroom-management tool. Simple assembly required. Batteries not included. This classroom set contains 10 Puzzle Board Kits. 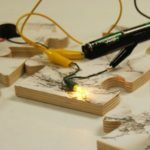 Each Puzzle Board kit includes a 5-piece puzzle board, motor mount, switch, bulb, battery holder, buzzer, motor, three LEDs, photodetector, mounting materials, hardware, and alligator clip wires. This unique learning kit is used for several activities in Unit 1. Introduction to Electricity of the Exploring Physics Curriculum App. 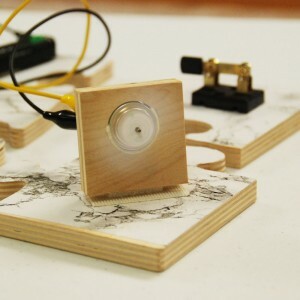 While introducing the concepts of contact points, closed circuits and the direction of flow of current, it also functions as a classroom-management tool. Simple assembly required. Batteries not included. If your classroom does not have multimeters, we recommend purchasing digital multimeters (available from several vendors). Additional wire strippers are sold separately.